Many people fear change and the unknown. They don’t like to step outside of their comfort zone, whether they’re fully satisfied in that position or not. And it’s no different when it comes to their career. Some think that because they don’t know what’s going to happen to them, they shouldn’t make a move to get a better job or switch careers to follow their passion. They don’t want to take a risk. It’s important to remember you don’t have to know what’s going to happen to you in your career. You should find what you love, and do it. And if that take two, three, four, or more tries, well, that’s part of the journey. One of our graduates, Toure Diggs, is on his third try now. He graduated from Post University’s Online MBA Degree Program in 2010. He sent us a note about how he’s doing today, and it made me think, here’s someone who’s dealt with change head on, and look where it’s taken him today. I wanted to share it with you as some advice for overcoming the fear of change and the unknown in your career. My MBA story is probably a bit different than others, because I really always gravitated towards social work. It’s what my undergraduate degree was in at Post University in Waterbury, Conn., a small 120-year-old institution which was a perfect on-campus experience for me. After graduation in the 90s, I launched into a career in social work. In the mid-2000s, I was inspired to further my education because I needed to expand my options in life as my family was growing and my own hunger to grow as a person increased. While working with my current employer, Continuum of Care, I realized I needed a master’s degree to further my career. Although I have a genuine love and care for people, I love business and entrepreneurship just as much. I struggled with which degree to pursue — a master’s in social work (MSW) or a master’s in business administration (MBA) — because I spent 15 years in social work and was currently working in the social work field. I also have a lot of experience in real estate, and I am an entrepreneur at heart, but felt I needed some formal education in business. Throughout the years, from 1996, I worked in the real estate business in some capacity. During the same time frame, I worked as a social worker for the State of Connecticut. But my heart was still in entrepreneurship. I resigned as a social worker (30 days before my son was born) and pursued a career in real estate full time. When the market crashed in 2005-2006, I was forced to fall back on my experience and educational background, social work/human services. I started researching college education programs offered online because I had a wife, a son who was two years old, a daughter who was three months old, and a full-time job as a manager of a 24-hour human services program for mentally ill adults. I initially researched MSW programs, none of which were offered online. I learned in my research the title “human services” would appear in the same keyword search of MSW. I found Post University. That was an easy decision because I earned my BA in psychology at Post University in 1994 and it was a really pleasant experience — in a small New England university, near my home. I tell everyone Post was made for me. So, now the challenge was simply deciding on which program — human services (MS) or MBA. I actually enrolled in the MS program at Post University and prior to registering for class, I changed programs a few days before the next module started. I felt the MBA was the most well-rounded degree, and it could help my current situation and create options for me. I started the MBA program in 2007. I completed the MBA in May of 2010. Since earning my degree, I have had two promotions. I am currently the Program Director of four programs for Continuum of Care, Inc., which includes 20-25 employees, 45 clients, two buildings, and five vehicles. I have written one proposal for the executive team to present to the board of directors to expand the agency into property management. I am also on the agency’s multicultural committee. I get the best of both worlds because I am working in the business functions of the agency, while using my experience in social work. Finally, I continue to pursue my personal business venture ideas. I have improved my entrepreneurial development tremendously since receiving my MBA. I have improved my knowledge and skills since graduating. The MBA gave me the tools to believe in my ability to launch a brand, even though my solid work experience was in social work. I am assisting my cousin with his current business venture, which we are preparing to pitch to investors in the near future. He has trusted me in structuring the business plan, coaching him through the business plan, as well as spearheading the operations plan. I have truly grown from the MBA program at Post University. It has prepared me to recognize my unique talents — and to capitalize on them. In addition to my experience in social work, in real estate, and now in business management, I feel uniquely qualified to pursue my dreams. But I believe it was because I was in the right program for me. 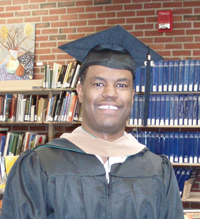 Toure didn’t know where his career would take him, but he felt that getting his MBA would open doors for him. It turns out, he was right. Congrats, Toure. What an awesome statement! I know that you are so proud as well as all those around you. Congratulations! Toure,we share having graduated from high school together, and now we share graduating from Post University together. I know you will continue to succeed as you always have. When you decide to do something you do it. We have had many conversations over the years, and have always noted that in spite of any obstacles, our pride in where we are in life. You, like myself, are not afraid of change, and when you see an opportunity you go for it. It sounds like you are headed in the same direction you have always been on as you Captain your ship, and you are maneuvering in a direction that is rooted in progress and discovery. From your old pal and fellow Post University Alum reciting our 1990 graduating class theme and song by Stacey Lattisaw and Johnny Gill; "Where do we go from here?" My answer to that is where life allows us to discover, learn, discover, and learn some more until we have determined we have found our niche. It looks like you have found one at Continuum of Care, and you and your cousin will find another one. You can find more than one. Hi Michael, thank you for those kind words. I really appreciate all that you stated here. I am sure we will speak soon. Take care and keeping up the good work.